Sun worship, snail style – HubNut – celebrating the average! Ah, sunshine is a marvellous thing. The 2CV still needs lots of work, including painting the recently welded bits, which are still finished in stunning zinc primer. It doesn’t stop me enjoying it though! I was ‘forced’ to drive around in the sunshine today, circulating posters for local music gigs my wife and I host at a local drinking establishment. 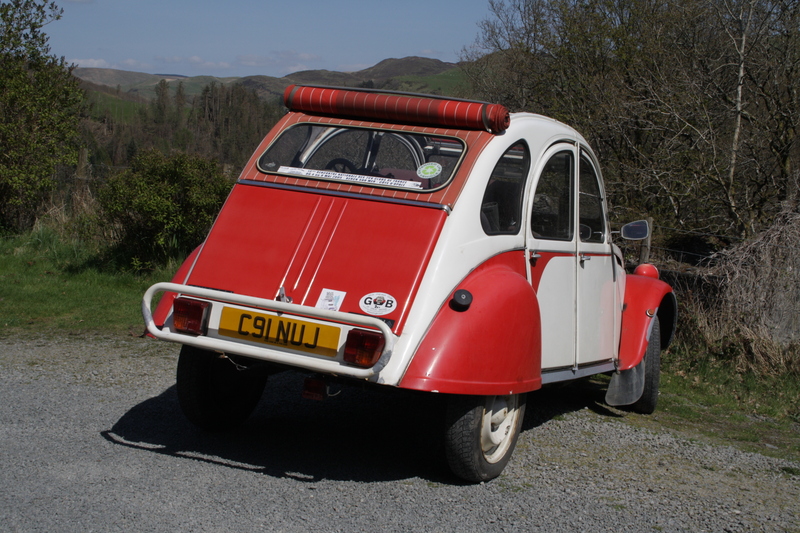 I’m thoroughly convinced that there is no finer way to travel around sun-soaked Welsh hills than in a 2CV. More power is almost entirely pointless. Well, ok, perhaps a little more going up hills would be nice. Pleasingly, my foot seems better this week, so thoughts of getting an automatic have been removed from my mind – aided by the state of my bank balance. The 2CV does still make my foot sore, but as an X-ray has revealed no structural issues, something muscular is likely to be at fault. Hopefully I can fix that unaided. I am glad that I persisted with the 2CV though. Major expenditure is bound to be needed within the next year, but how can I get rid of the only car that I’ve owned for longer than 18 months? With over 60 vehicles passing through my hands, it says something about this 2CV. How on earth did a little French peasant wagon, in silly Dolly guise, get under my skin quite so much? I don’t have the answer to that, but perhaps some questions don’t actually need an answer.